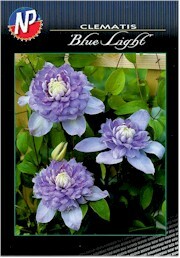 May 23, 2001 - Clematis "My Angel"
Greetings from Pride of Place Plants Inc.. Please find enclosed an update and overview of the activities of Pride of Place Plants. We have been very pleased by the progress reports from the licensed growers and enthusiastic about the Press Coverage afforded the current cultivars. The Front Cover of the March 2001 edition of Garden Center Merchandising and Management Magazine highlighted Gaura lindheimeri "Blushing Butterflies", one of the three Gaura that make up "The Butterflies Collection" The Front cover of the May issue of Digger Magazine brought a great deal of attention to Clematis Konigskind (child of a King) and subsequently to Clematis Rosea Konigskind (pink child of a King), both originating from Westphal ClematisKulturen in Prisdorf Germany. "The Kivistik Collection" of Clematis was introduced to the trade and the first eleven cultivars to be released in 2002-2003 have gathered enough attention to become a sold out item prior to the official release date. Hydrangea macrophylla 'Fireworks' P.P.A.F. "Hanabi" was awarded "The Green Thumb Award" recognizing outstanding products offered through members of the Mail Order Gardening Association. Clematis 'Engelina' P.P.A.F. 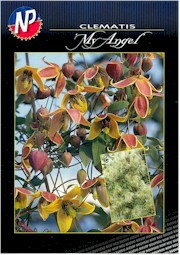 "My Angel" has been chosen by Better Homes and Gardens Magazine as their Plant of the Month for the September edition. Our advertising budget was used for full page, four color, ad-copy in American Nurseryman, N.M. Pro Magazine, G.M. Pro Magazine,Garden Center Merchandising and Management and Grower Talks Magazines. Beginning again July 1st, 2001 through to May 2nd 2002, we have increased our budget to allow for twice the exposure ! Our web presence, has seen a dramatic increase in user hits. www.prideofplaceplants.com and www.icangarden.com/NewEden together received 350,000 hits over the past 12 months. Future prospects look good as well, not only the increase in the promotion of existing product lines but the introduction of New lines. From Japan a collection of newly bred Clematis cultivars never before seen and a collection of double flowering Hydrangea species and cultivars. From Australia, three New Lavandula cultivars. From Estonia 12 more Clematis cultivars within "The Kivistik Collection" and from Europe a group of interesting shrubs, conifers and perennials. We are hopeful that the combination of good plants from skilled breeders, in the hands of good growers and retailers combined with our promotional efforts will begin to satisfy the home gardener's appetite for Fine New Plants Introductions. Better Homes and Gardens Magazine is the largest of it's kind in North America with a total of 7.6 million paid circulation and a readership of 30 million.